Hi, I am also part of the Let's Lunch group; but, did not get a chance (darn work) to participate this month. Now I am nibbling through everyone's delicious light lunches. I did not know so much about dandelions or as we call them wish dandies. I knew you could eat the leafy greens, but did not know about the flower. Very interesting. I wish you lived closer, I'd love to check out on of your salons. I loved all the wonderful information on dandelions!!! I've enjoyed the greens in salads but I've never had a dish with "just" the greens and now I am intrigued to try them! Also love the idea of these "salons" - you are just too darn creative!!! I've never had dandelions before, nor did I know that they were so good for you either! I'm totally intrigued now, and I'm going to have to try some. Loved the education on dandelions and the recipe to include them for a light lunch over conversation. 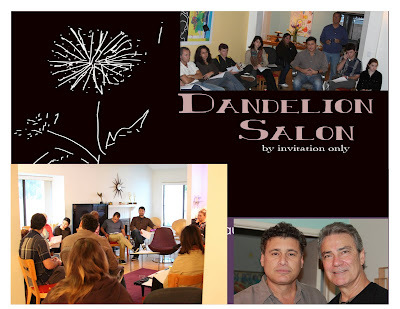 Had no idea about dandelion salons and have to learn more now. You have such innovative and tasty recipes. An inspiration to all! This is spectacular. Such beautiful photos and such a truly amazing new perspective on the dandelion! And to think I've always looked at them as little yellow pests. A wonderful recipe and story, too. I love that you made such an elegant dish with something that most people yank from the ground and toss away. Dandelions are so under-appreciated. A friend of mine here told me recently about how her father picks the very small, very young greens growing near their house in Geneva and makes the most amazing salads each spring. Dandelion flower are singular an big. That picture with the fluffy seed head looks more like a sonchus (sow thistle) than a dandelion. Both are edible.